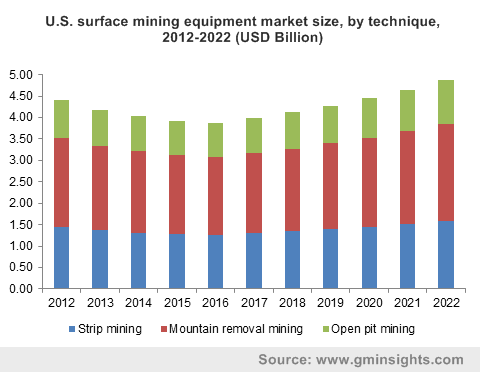 Surface mining equipment Industry « Global Market Insights, Inc. Considering the various techniques that are implemented in the mining process, open pit surface mining equipment market is gaining a huge popularity. The fact can be credited to the increasing demand for diamond, Sishen, and Palabora copper ore across the world. These metallic ores are mainly excavated by open pit mining. It accounted for almost 31% of the overall industry share in 2014 and is forecast to collect USD 9.31 billion by 2022. Surface mining equipment industry from strip mining is also expected to grow substantially at an annual rate of 3.5% over 2015-2022, with a revenue projection of USD 12 billion by 2022. Overall metallic ore excavation covered a major portion (45%) of the overall surface mining equipment market in 2014. With the rising demand for metal ores like gold silver, zinc, and chromium globally, this sector is projected to record a revenue of USD 13 billion by 2022. Non-metallic ore extraction based market will also chart a profitable growth trajectory. As per an estimation, this sector is anticipated to cover 30% of the overall surface mining equipment industry by 2022. Salt, lime, and phosphate are the three-main products, that are thriving the non-metallic ore extraction market share. Asia Pacific surface mining equipment market is highly influenced by the growing metal and coal mining activities across the belt. Heavy demand for metallic ore extraction and high mineral consumption for domestic purposes are the two major factors that are allowing APAC to stand as one of the prominent players in the global market. With India and China at the growth forefront, APAC industry is set to register the highest growth at an annual rate of over 4% over the coming five years. North America dominated by U.S. surface mining market is also anticipated to cover a lucrative share of the overall industry, by accounting for a revenue of USD 7 billion by 2022. Technological interventions in the surface mining equipment market have resulted in maximum exploitation of mines and have also catered selective mining processes which enables high-quality extraction. The ability of these hi-tech equipment to improve the surface stability by involving less vibration, noise, and dust in the process is making the market demand high. However, lack of skilled professionals along with health hazards associated with the process is expected to negatively affect the growth curve of the industry. Nonetheless, increasing global demand for gold, diamond, iron ore, coal will drive the surface mining equipment industry share in the years ahead. Key players of surface mining equipment market include Vale S.A, BHP Billiton, Rio Tinto, Anglo American, Barrick Gold, Freeport-McMoran, and Goldcorp. This entry was posted in ENERGY, MINING, OIL AND GAS and tagged Surface mining equipment Industry, Surface mining equipment Manufacturers, Surface mining equipment Market, Surface mining equipment Market Analysis, Surface mining equipment Market Growth, Surface mining equipment Market Outlook, Surface mining equipment Market pdf, Surface mining equipment Market Price, Surface mining equipment Market Report, Surface mining equipment Market Share, Surface mining equipment Market Size, Surface mining equipment Market Trends.